Four changes for the Dubs, two for the Deise. 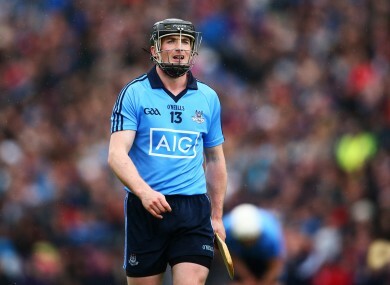 David 'Dotsy' O'Callaghan returns for Dublin on Sunday. BOTH DUBLIN AND Waterford have made personnel changes to their starting line-ups for Sunday’s All-Ireland hurling quarter-final at Semple Stadium, Thurles (2.00pm). Dublin manager Ger Cunningham has made four changes from their win over Limerick in the qualifiers, while the Waterford side that lost the Munster final to Tipperary shows two alterations. For the Dubs, Cian O’Callaghan and Joey Boland are drafted into the backline at the expense of Niall Corcoran and Shane Durkin. Elsewhere, Niall McMorrow replaces Daire Plunkett in midfield and David ‘Dotsy’ O’Callaghan takes the place of Eamon Dillon in attack. Darragh Fives comes in at midfield for Derek McGrath’s Waterford in place of Eddie Barrett, while Shane Bennett replaces his brother Stephen in the forward line. Email “Dublin and Waterford ring the changes for All-Ireland hurling quarter-final”. Feedback on “Dublin and Waterford ring the changes for All-Ireland hurling quarter-final”.